Ashdown & Bee is a small creative team based in Sydney, specialising in creating beautifully styled weddings and bespoke hand drawn signs. Their artistic + cutting-edge style sees them designing events and signs filled with atmosphere, fun and love. We spoke to Melissa Murray, co-owner of Ashdown & Bee to see what inspires her. Melissa: My name is Melissa Murray, co-owner of Ashdown & Bee. I’m a wedding stylist and also run a handpainted signage business with my husband Simon. I’m obsessed with beautiful flowers, scents, typography, food experiences, my baby pug and all things beautifully designed! Modern Wedding: How did you get started as a stylist? 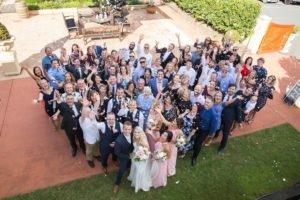 Melissa: I worked as an event co-ordinator at a few venues around Sydney, but really wanted to get more into the creative design side of events. After studying interior styling, I launched my business Ashdown & Bee with my then boyfriend, (now hubby) and went from there! We started hiring out a lot of the props I had collected over the years, and have kept building on the collection as each event we do goes to keep our look fresh and modern and suitable for our gorgeous clients. We started doing some photoshoots, and still do regularly, to give our clients inspiration and to also push our creativity further and direct new trends and styles that we love. Modern Wedding: What colours and colour palette combinations do you love for next 12 months? Melissa: White with touches of black and a pop of pink! Modern Wedding: What are your favourite new styling trends for 2017? Modern Wedding: What are your five favourite styling elements to work with right now and why? Melissa: I love adding a linen napkin to a tablescape, whether it be a blush pink or a natural fibre beige, either tied with a knot or adding a flower stem or spring of rosemary! Neon signage is really cool, whether we hire one in or have one custom made. Modern Wedding: If you were designing your own wedding, how would you style it? Melissa: I designed my dream wedding 6 months ago and included an abundance of flowers, both in supersized arrangements and also hanging branches (magnolia + olive branches)….. The colour palette was white with touches of gold (through the gold foil stationery, gold cutlery, gold candlesticks) and florals were pinks and red and whites and greens. We added marble cut place cards, a custom neon sign in an industrial exposed-brick warehouse. A mix of romantic and urban!